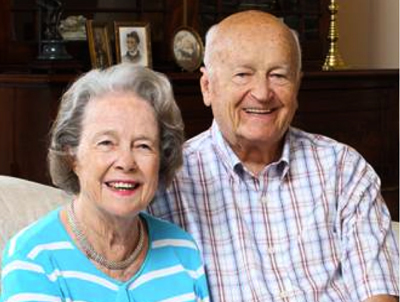 As indicated by the school’s tagline "a new school of thought", the University of South Carolina School of Medicine Greenville is an educational experience like no other. Academic medicine is a broad-reaching concept on this campus. These institutions formed partnerships decades ago that have culminated in the Health Sciences Education Building, where the medical school is located, and an ever-evolving set of pipeline programs to lead the best and brightest into the full spectrum of healthcare careers. The new medical school is the crowning achievement of these efforts. The school opened in 2012. 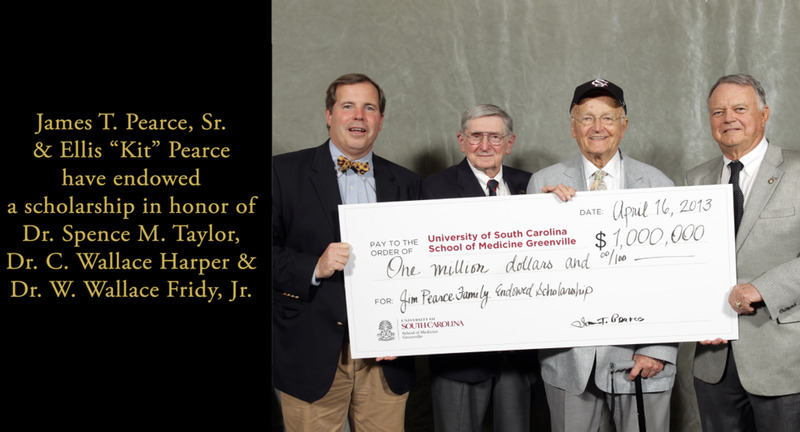 The University of South Carolina and Greenville Health System are in campaign to raise funds, primarily around scholarships, for the medical school. This partnership has posed many questions about donor stewardship. Both USC and GHS have long-standing donor recognition standards, but both were willing to make concessions for this unique entity. Therefore, donor recognition at the medical school draws from the best of each institution. It employs the historical storytelling traditional at GHS and the naming protocols and use of technology typical of the university. To that end, donors to the University of South Carolina Medical School Greenville are presented in an architecturally integrated, easily maintained display that includes an electronic component that was designed and implemented using the school’s technology staff, with guidance from Heurista. This design required integration of the display components into an existing stainless steel frame in a lighted plexiglas wall. Heurista engineered a system that allows for occasional removal of the components to maintain the electronics and lighting for the wall on an as-needed basis. Additional displays will be added over time, with customization required for each installation. The University of South Carolina partnered with the Greenville Hospital System to create a school of medicine campus in Greenville. Heurista was contracted to create a program of donor recognition for the partnership that successfully integrated the existing policies at USC, the branding of the two institutions and the other institutional partners involved, while also giving voice to the unique identity of the school and the donors that helped make it possible. The guiding donor recognition policy that Heurista created does that, and more. We developed a multi-faceted donor recognition program, and the first physical display to showcase the decisions made was installed January 2014. Another challenge was that the Health Sciences building was built with a series of existing custom stainless steel framed cabinets that were installed in the locations originally intended for philanthropic and stewardship use. It was decided that our designs should retrofit the existing cabinets rather than start with a blank slate. Using a combination of materials familiar in current USC donor recognition displays and adding some new materials and textures, we created a subtle evolution and modernized the look considerably. 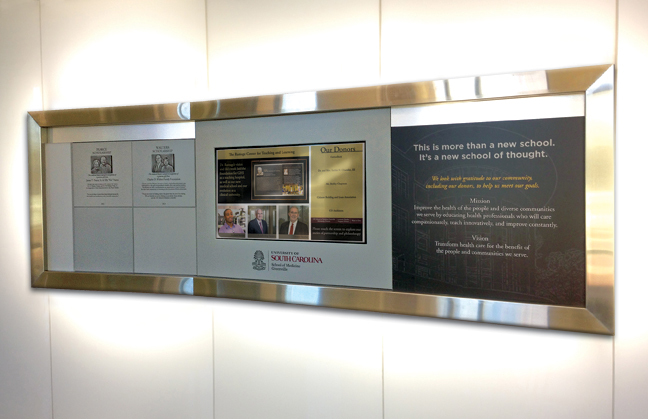 Now, cases that had been mostly empty and barely noticed contain room for a print graphic panel that also can act as future expansion space for naming plaques, a series of plaques in honor of the first major donors to the school of medicine, and an interactive touch display. The design direction established at the School of Medicine will now be taken to the main campus, first with the new Darla Moore School of Business. Heurista is excited to be part of the continuing growth of USC. 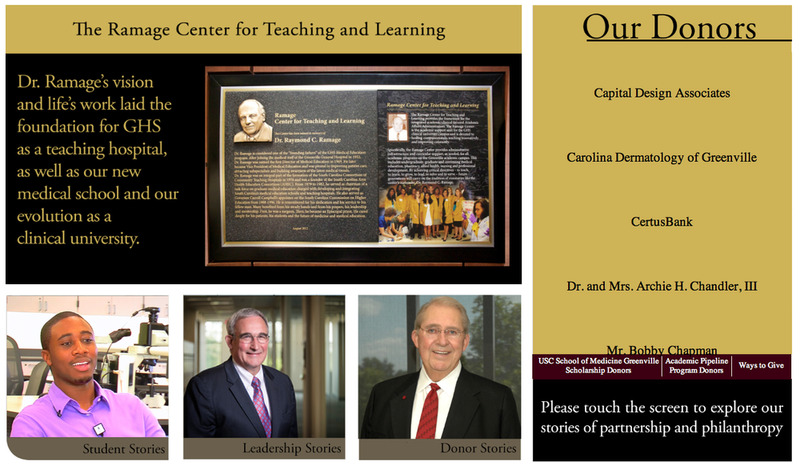 The donor plaques installed in the USC School of Medicine Greenville.